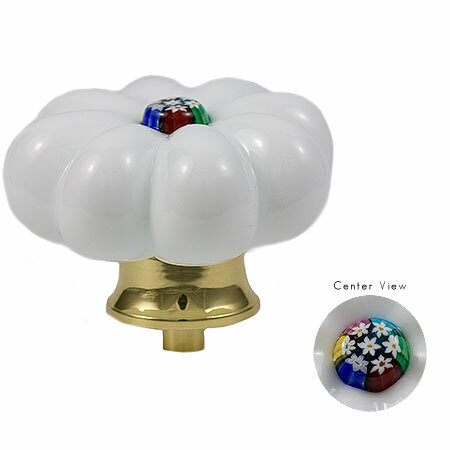 Handmade in the furnaces of Murano using proprietary glass recipes, this drawer pull has a base layer of white glass which is formed into a flower shape, then accented with a single slice of murrine. Each glass pull is then set into hardware by Bal Manilgie, an Italian company known for it classic designs using quality metals and elegant finishes. Approximate dimension are: 1 5/8" in diameter, extending 1 1/8" from drawer/cabinet when installed. Available hardware finishes are: silver, bronze, gold.